Yes, I just said that the blog was going to be quiet for a few weeks. 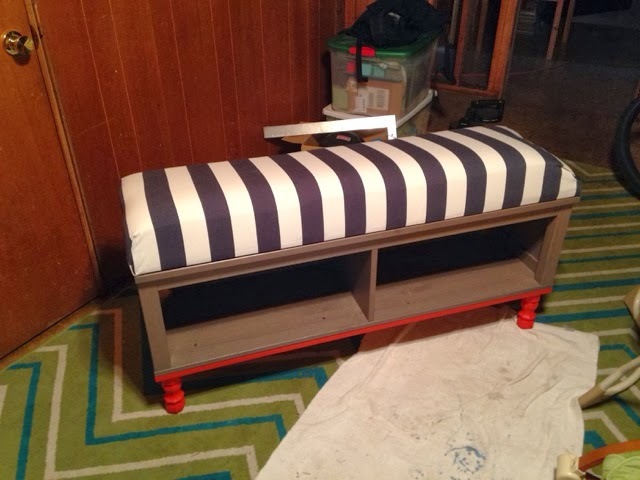 Then I finished up the bench for the baby's room during Ben's nap time and I couldn't resist posting a little photo. This had been a last minute project and I can't wait to see how it looks in the finished nursery. Now off to find a few storage baskets. So cute! What did you use for the cushion? Did you have a piece of foam custom cut? During the summer camping season, that is. My advice is to get the thickest, most dense stuff you can afford. Or even buy existing cushions and recover them.